FTL and LTL road freight service. Logisticentrum team can offer a solution to every possible transport enquiry. Our main goal is to focus on quality and accuracy. Every growing or grown up company needs its goods on the right time in the right place. Reliable delivery – that is what we aim for. With headquarters in Estonia, we do transportation services to destinations such as Germany, France, Netherlands etc. All central and eastern Europe, Greece, Bulgaria, as well as southern European countries such as Spain, Italy and Portugal. Destinations within 600 km of your company locations are supplied within 24 hours. Logisticentrum handles every possible type of transport (ADR, Express, LTL, FTL). We are operating on every destination with our team of carefully selected carriers who care about your delivery. 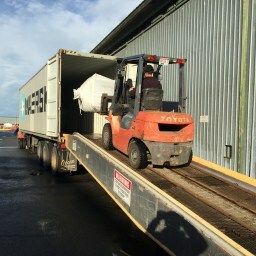 Full Truck load or Full Trailer load (FTL) is when the product being shipped is the only piece on the trailer filling the entire length of the trailer or reaching the weight capacity. If your production line can wait, and your company can gather goods to fill whole trailer – then shipping FTL would be considerably cheaper and faster for you than LTL. Freight which doesn’t require the entire space of the trailer. LTL allows multiple senders to share space on a same truck, making it cheaper to send smaller freights. LTL is perfect for freights with weight less than 15tons. Freight up to 1.5 tons can be delivered the same day or the next day with smaller trucks. Express delivery on big trucks is also possible, with two-driver trucks.